Happy weekend everyone! Hope you all had a fabulous week. For me it was a very busy week because I attended the Magic trade show in Las Vegas. This trade show is held twice a year (February and August) in Las Vegas and it is a fashion marketplace that showcases women’s, men’s and children’s apparel, footwear and accessories. There is also a section for manufacturing resources from around the world where I was able to source fabrics, trims and buttons. Even though I had been to the show before, I hadn’t been to one in the recent years. This year I decided it would be a good time to go out looking for new products plus find some new resources for materials like fabrics, trims and buttons for Jacket Society. My husband decided to join me for the trip which was great company driving and walking the many aisles at the Mandalay Bay and Las Vegas Convention centers while I shopped for new products and ideas for JS. Now I am back in Los Angeles, refreshed with lots of new ideas for the store and I can’t wait to share some of them with you in the near future. Today I have two casual, yet chic looks for you. 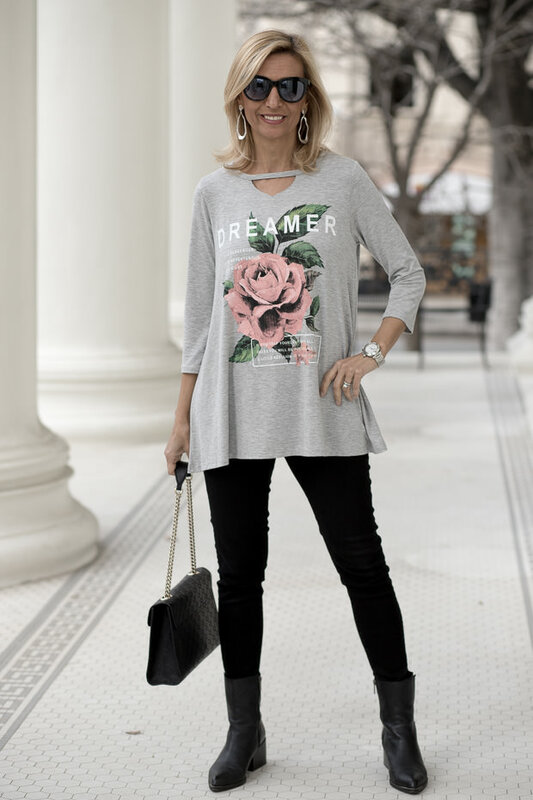 For the first look, I wanted to restyle our Rose Cape Vest for a second time since I think it is a very pretty pink color that you can wear now and take into spring. It is also a great piece you can wear for Valentine’s Day or gift it to a loved one for this occasion. 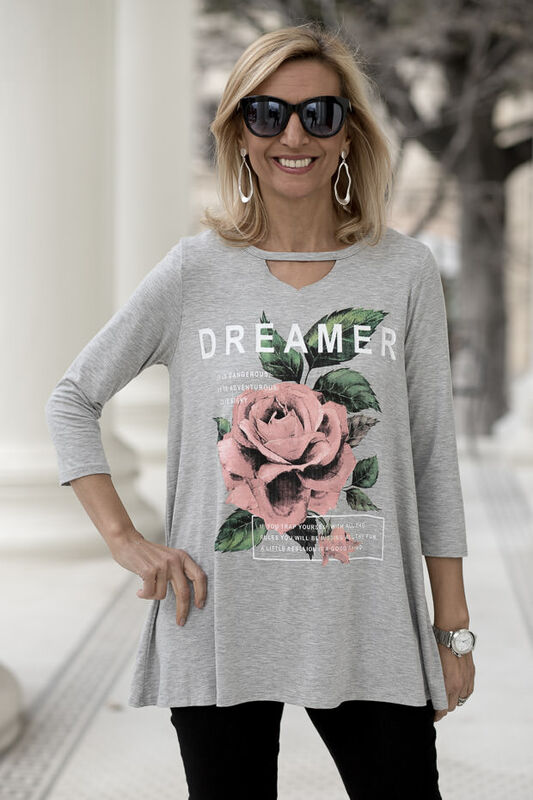 Today I am wearing it with our Heather Gray Dreamer Graphic Top. The top is an easy to wear t-shirt body that is slightly A-line in the bottom. It has a beautiful graphic design on it with a pink rose and inspirational writing about “Dreaming big”. The pink rose color works really well with the Rose Cape Vest. This top is currently on sale so you can get additional savings on it this weekend with our flash sale. I also did a second casual look with another one of our tops that is also on sale, our Stripe and Solid Twofer Hooded Top. This is a super fun top that makes it look like you are wearing two tops layered, but it is really all one piece, hence calling it a twofer. The body is over sized and loose in a gray solid knit fabric. The hood and the bottom of the top are made out of a cute stripe. For accessories I wore our brand-new Silver Oval Shape Hoop Earrings. These hoop earrings are very pretty, and they can work with so many outfits. All four pieces I am showing you today are part of our Weekend Flash Sale where you can get 15% off with code FS29 plus Free US Shipping. All international shipments are a flat rate of $25.00.